Monday Morning Drum Major will put a brief spotlight on the personalities in the drum corps universe. We'll run it each Monday (obviously). If you have an item worthy enough for mention on Monday Morning Drum Major, e-mail it to dave@dci.org Talk about a whirlwind tour! As mentioned here last week, Brian Hickman, Beth Schindel-Gilliland and Rod Owens of the Glassmen were in Europe last week, finalizing plans for the Glassmen's tour of Europe this coming summer. 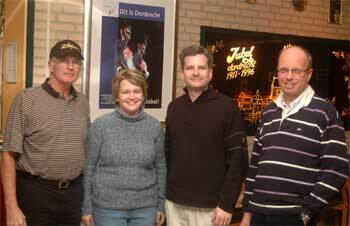 (Left to right) Rod Owens, Beth Schindel-Gilliland and Brian Hickman of the Glassmen meet with Jubal President Bert van Maaren in Dordrecht, the Netherlands, last week. According to Hans Kloppert of the Dutch corps Jubal, who has been working on plans with the Glassmen, the three initially flew into Paris yesterday to check out show venues in Northern France. The Glassmen crew also cruised to Dordrecht, the Netherlands (home base of Jubal), where they will tentatively perform in the "Evening with the Stars" contest on June 30 -- a show that will feature 12 corps. Later in the week, the three squeezed in some sightseeing in Antwerp and Bruges, Belgium, before flying home yesterday. "Four countries in four days!" Kloppert said. Do you have an item worthy enough for mention on Monday Morning Drum Major? E-mail it to dave@dci.org .